For other uses, see Zigzag (disambiguation). A zigzag is a pattern made up of small corners at variable angles, though constant within the zigzag, tracing a path between two parallel lines; it can be described as both jagged and fairly regular. From the point of view of symmetry, a regular zigzag can be generated from a simple motif like a line segment by repeated application of a glide reflection. The origin of the word is unclear. Its first printed appearance was in French books in the late 17th century. Lightning and other electrical hazards are often depicted with a zigzag design, with long downward strokes and short backward ones. The trace of a triangle wave or a sawtooth wave is a zigzag. Pinking shears are designed to cut cloth or paper with a zigzag edge, to lessen fraying. 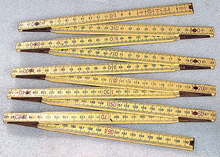 A carpenter's folding ruler can be folded to look like a zigzag. Zigzags are a basic decorative pattern used on pottery, and are often seen in the cuts which separate pieces of ravioli pasta. In sewing, a zigzag stitch is a machine stitch in a zigzag pattern. The zigzag arch is an architectural embellishment used in Islamic, Byzantine, Norman and Romanesque architecture. The stripe on Charlie Brown's infamous yellow shirt is indeed a zigzag. ^ Google Books: "Word Origins and how we know them"
^ Allen, Terry (1986). "4". A Classical Revival in Islamic Architecture. Wiesbaden. ^ Allen, Terry (2008). Pisa and the Dome of the Rock (electronic publication) (2nd ed.). Occidental, California: Solipsist Press. ISBN 0-944940-08-0. Retrieved January 28, 2012. Wedgwood, Hensleigh (1855). "On Roots mutually connected by reference to the term Zig-zag". Transactions of the Philological Society (2). Wikimedia Commons has media related to Zigzags.